Gripnail has been in business since 1966 and has always developed specialized application equipment to install each type of fastener. This "systems approach" eliminates as many variables as possible to insure the greatest possible customer satisfaction. In 2004 Gripnail became a 100 percent employee owned company. As an ESOP (Employee Stock Ownership Plan) everyone who works for Gripnail or Gripnail's Amtak marketing division, has a vested interest in making certain that customers needs and corporate goals are met or exceeded. We appreciate your business because this is our business. 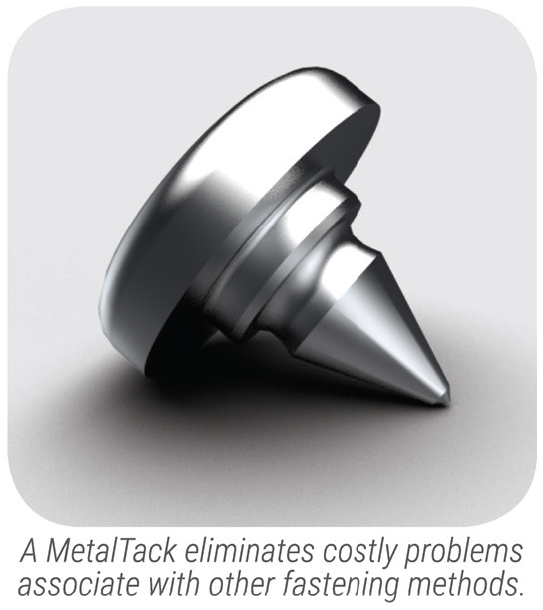 A MetalTack Fastens lightweight parts to solid metal products such as pumps, valves and machinery. It is impacted directly into the base metal and forms a permanent mechanical connection which will hold up to 250 pounds. There is no need for drilling or other surface preparation and MetalTack is perfect for attaching name plates, barcode tags, and cable tie mounts.